The UK property industry’s first in-house drone service. Paragon has launched what is believed to be the UK property industry’s first in-house drone service following the recruitment of a highly experienced aerial surveyor. Elliott Garrett joins the London, Manchester and Edinburgh-based business following nine years’ experience working for Formula One Management. In his previous role, he travelled the world planning Grands Prix infrastructure and conducting precision GPS surveys of racing circuits using Global Navigation Satellite Systems (GNSS), laser scanners and drones. The innovative new service sits within Paragon’s building consultancy department and is already being used to produce condition reports on commercial and retail buildings in industrial estates, city centres and high streets. It provides Paragon’s clients with faster, richer and more cost-effective data compared to traditional models, and easier access to properties than access hoists. Drone surveying works by combining high resolution GPS-tagged photographs, 4k video and photogrammetry software to create 3D models, site mapping, fly-over videos and roof surveys. 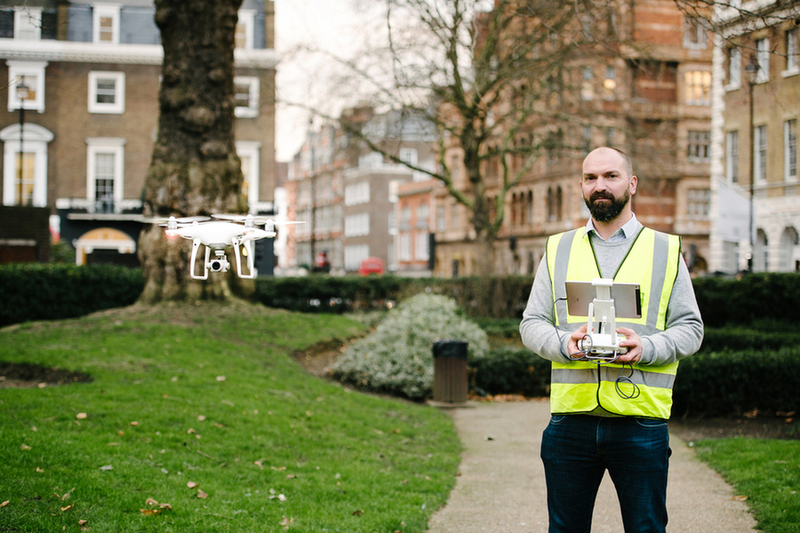 Commenting on the drone service launch, Paragon joint managing director, John Munday, said: “When it comes to surveying, the property industry is a dinosaur that still uses slow, archaic processes. Embracing drone technology will be to the benefit of surveyors, developers, property funds and contractors alike. Paragon also expects footage from drones to be used by clients to create impactful marketing videos, giving them a commercial advantage when selling or letting an asset. During construction projects, drones will also be used instead of time-lapse cameras to give accurate and real-time measurements of the mass of the site, helping avoid disputes about progress. Commenting on his appointment, Paragon aerial surveyor, Elliott Garrett, said: “Having worked closely with Paragon, I know it is a business brimming with innovation and ambition. Elliott is fully insured and has all relevant permissions from the Civil Aviation Authority. Paragon was founded in London in 2009. The consultancy employs more than 100 people, has a turnover of £13m and is expert in all aspects of building surveying, project management, project monitoring, cost consultancy, rights of light and party wall, M&E, occupier services and sustainability and environmental services. Paragon delivers a director-led service focused on technical expertise, commercial business acumen and a proactive approach to service delivery.